He was young, handsome, of noble lineage and of impeccable character. He was known as “The Truthful” and “The Trustworthy”. Yes, he was born an orphan and his financial standing was not the best when Khadija (ra) met him. But he, nevertheless, was the best of the best. The epitome of the human race, when Khadija (ra) proposed to him, was a young 25, when she was 40 and widowed twice before, having borne children from both earlier marriages. He could have had any younger girl, any virgin who did not carry with her the baggage of widowhood and children. So why, then, did he accept her proposal? Firstly, the “he” in question was Muhammad (pbuh), a young man but not just any man. Although he had not yet attained prophethood, he could look beneath the surface….the superficial. 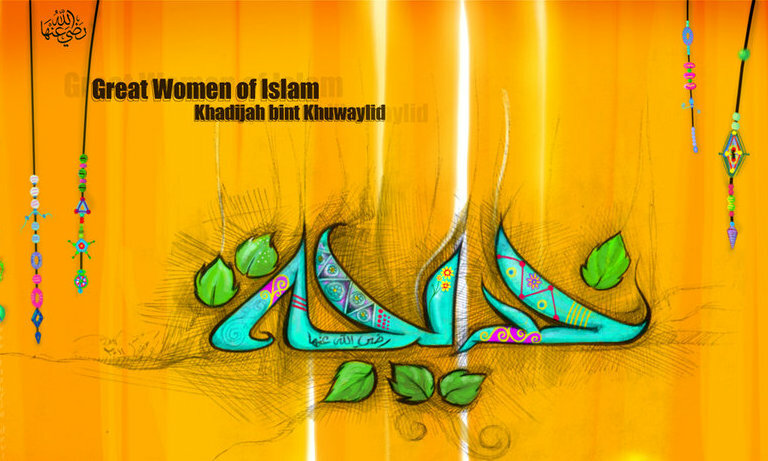 Khadija (RA) even on the apparent was a beautiful woman. “Ameerat-Quraish” or “Princess of Quraish” as she was called, she was rich, beautiful and had social standing. Yet, for Muhammad (pbuh), it would have to be more than riches and beauty that drew him towards the decision of accepting this proposal. Khadija had qualities that were unmatched, as time would prove; Maturity, wisdom, intelligence, loyalty, generosity and courage. Secondly, this was the woman (like all of his other wives) who was chosen to be his wife by Allah in His infinite wisdom. She was the only wife who bore Muhammad’s (pbuh) children and had the longest singular companionship with him – a companionship of almost 25 years. She was to be the backbone of Islam, the foundation stone of Islam, the first ever Muslim who believed in Muhammad (pbuh) as Allah’s last and chosen Prophet. If it were not for her unflinching support for him and unequivocal faith in him, Muhammad (pbuh) would have still done what Allah destined for him to do, but without Khadija (ra) beside, it would have been a lonelier and even more tedious journey. She opened the doors to her home and heart to him. She shared her wealth with him. She took into her home his cousin, the young Ali (ra) And then there was Zaid ibn Harith (ra). And then, there were their own children – Qasim (who died young), Zainab (ra), Ruqayya (ra), Umm Kulthum (ra), Fatimah (ra) and Abdullah (who also died very young). And this blessed home’s doors were open to all – charity was a norm – an abundant norm. As a couple, they complemented each other so beautifully and thought so much in synch, that goodness was what their world was full of. The years before and around prophethood of Muhammad (saw) would have been tough for her. Imagine how she felt when he disappeared into the cave of Hira and did not come home for days. Any wife in her position would cease to see the bigger picture and let the desire to own her man and his time take over. But Khadija (ra) knew her man. She allowed him the space he needed to grow inch by inch and day by day towards prophethood and her support remained unequivocal. There are reports that she would climb up to the cave of Hira and carry food and water for him. She was not exactly young at that time. But she did what it took to support him. Perhaps the most well-known and yet never deplete of lessons and emotional impact is the incidence when the Muhammad (pbuh) returned after he received the first revelation from the cave of Hira, having witnessed the angel Gabriel (as); shivering, and scared. Realizing somewhat what a massive responsibility laid ahead of him, understanding that his life would change forever, fearing for his safety, and in those moments as he asked her to cover him with a blanket. It was Khadija (ra) by his side – to comfort and calm him down. We all need that one person, at least, to believe in us implicitly, to know our mettle, to bring out the best in us and to be our fall-back. We need to know in moments of fear and insecurity and vulnerability that there is someone who will stand by us, no matter what. And the bigger and more important a human’s intended task or goal, the better will be the person Allah chooses to complement us, to facilitate an ultimate aim. For Prophet Muhammad (saw), Allah chose Khadija (ra). Muhammad (pbuh) included her in the four foremost ladies of the universe: Khadija bint Khuwaylid (ra), Fatimah bint Muhammad (ra), Maryam bint Imran (the mother of the Prophet Isa) and ‘Asia bint Muzahim (the wife of the Pharaoh). It is no wonder, then, that Muhammad (pbuh) never really got over her death. He called the year of her death “the year of grief”. A Companion of the Prophet narrates that whenever any gift was brought to him he would immediately send it to some lady who had been a friend of Khadija (ra). Ayesha (ra), a favourite wife of Muhammad (saw) says that whenever a goat was slaughtered the Prophet (pbuh) would send some meat to Khadija’s (ra) friends; when she remarked about this on one occasion he told her that he had great regard for her friends, as she had a special place in his heart. Ayesha said she never experienced such a feeling of natural feminine jealousy for any other wife of the Prophet (saw) as she did for Khadija. She also narrates that whenever Muhammad (pbuh) spoke of her he would talk at great length and praise her qualities, and pray for her forgiveness. Her place in his life can easily be understood by the fact that till she lived, the young Muhammad (pbuh), in the prime of his youth, did not marry any other woman. She fulfilled all his needs and gave him the happy content married life that is required for anyone who wishes to achieve or do anything great in life. Khadija (ra), Mother of the believers, took care of the home front and gave Muhammad (pbuh) support in the worst of times, enabling him to do what he did. For her part, she understood and appreciated him and his responsibility. For his part, he cherished and appreciated who she was and what she meant to him. Together, they complemented each other, working hand in hand for a cause bigger than anything. Masha Allah, a marvelous piece of work and really, the greatest and truest love story…. Very nice and well articulated article. Thank you so much sister for it. I wish you the best in your journalism career.